In accordance with its former practice, the Court’s answer was positive in general, but it highlighted that the case must be examined considering all circumstances, especially the relevant market, the fame of the trademark and the habit of the consumers. It is interesting that the judges decided against the proposition of the Advocate-General, which is relatively uncommon in the practice of the Brussels plenum. The European Court of Justice was the one who made this decision in January, this means that the verdict of the British Court is necessary for the final victory. This wasn’t the first suit between the two huge companies. Earlier Cadbury wanted to register the colour purple for one of its products, against which Nestlé claimed. The Swiss company lost this case on first instance, however won after filing an appeal. In order to secure its four-bar-form, Nestlé filed a suit in Singapore where a company called Petra manufactures a chocolate product with the similar form. Due to lack of distinctive power, the three dimensional trademark was not registered in Spain. Furthermore there were suits also in Hungary and in the Czech Republic. In the first case the court saw the fact of design infringement proven, in the second case Nestlé referred to the fact that in Germany they approved the distinctive power, but this did not convince the Czech judges. The KitKat shape – is it distinctive without the logo? 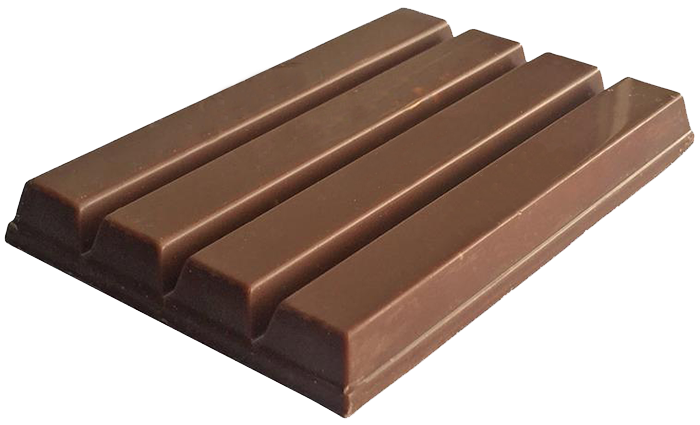 The present case, in which the European Court rendered its decision, started out when Nestlé wanted the register the chocolate’s typical form – four bars, sticking closely one to another – as a trademark. The concept of 3D trademarks has been known in the old members of the EU since the seventies and it broke into the post soviet area due to the obligation of law harmonisation. The biggest positive feature of this possibility is that the exterior design of the product can be renewed unlimitedly after the patent protection and design protection are over. This is the reason why it can be the final front line of the intellectual property protection, thus for every business it has to be a highlighted part of their IP portfolio management. Cadbury submitted an opposition to the UK Intellectual Property Office, claiming that this solution is necessarily coming from the product’s function and because of that, it cannot gain protection. The office agreed with the opposer. However, The British court asked a preliminary decision from the European Court of Justice, trying to have an answer to the question whether the result of the survey could be used as proof. Last week the Court answered the questions in its judgment (C‑215/14 Société des Produits Nestlé SA v Cadbury UK Ltd). The Court held that all of the features either resulted from the nature of the goods themselves or were necessary to obtain a technical result, thus this shape is excluded from trademark protection. The Court did not accept to use the result of the survey as evidence. So, what is the conclusion? Despite of the fact that there is a trademark directive and because of that most of the trademark acts are similar, the practice of the EU members are different. So if you have enough resources you can try the same legal argument at another country’s court – you might have a chance of winning. On the other hand, if you have a favourable former verdict, that does not mean you will win the suit. Secondly, the owners of the well-known trademarks, who are usually multinational and multi-million dollar companies, are on the side of the zero tolerance, so they sue if anybody anywhere in the world if they do something which suggests usurpation. They have nothing to lose. If they lose the suit, the costs of it are very tiny for them compared to the threatening power they gain. In case of victory, they set an example for everybody who even dares to think about using well known trademarks on their own products or services.